» Behold the new Albany flag! Behold the new Albany flag! Confluence and Crossroads — that’s the symbolism of the new Albany flag. You’re looking at the winning design for an Albany flag, chosen by the city council Wednesday night, though what will be done with it is not entirely clear, at least to me. The city conducted a design contest after a club of students at West Albany High School asked the council to consider adopting an official Albany flag. For some reason the students are fascinated with what they consider good principles of flag design, and they call themselves the Greater Unified Albany Vexillological Association. The contest produced 40 entries, and a jury’s review resulted in five semifinalists. Those were subjected to a rating by the public, and 258 people submitted their opinions. One of the original designs by the club as a group came out on top of the rankings, and that’s the one the city council voted to accept on Wednesday. The flag club called this design “Confluence and Crossroads,” and you can see both concepts carried out in what amounts to a pictogram. Kellum lacks an understanding of community. 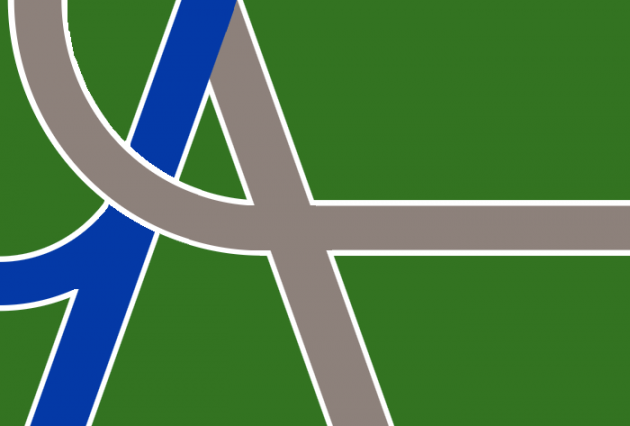 So folks want to foster a sense of community by creating an Albany Flag. Bless them for caring. Kellum has a lot to learn. What Kellum does understand is that when a group of High School Students come to the council wanting to do something, the first question we should ask ourselves is “does this need done” then if so by whom? My concern at the outset was that once we accepted a flag, is it now an official flag? Or is it just “kinda nice.” Kellum knows that this is the type of stuff you work out before you make a commitment to anything…. No Bob, the first thing is to say Welcome. Are you always this much of a jackass when people are interested in things you don’t care about? Congrats to the winner. Well done design. Like it. Jim, perhaps you should hang it upside down. Ya know, the symbol of distress? Would the “Confluence and Crossroads” city of Albany flag be improved by removing the white curbs? Perhaps the contrast is called for as a dividing line of the other colors, but removing them may present a softer appearance and be easier on the eyes. I read about the 5 semi-finalists in the City Bridges and voted. For what it’s worth, the winning flag was my first choice. It was interesting reading each artists thoughts behind their design. Confluence and crossroads is well represented in the flag. The colors of green for Oregon and blue for water plus the grey to represent the town’s history in the rare metals industry is bold yet simple. I know the plan is for it to be carried in the Veterans Day Parade this year. Perhaps the the marching bands from the city’s schools could carry it any time they perform here or out of town to represent civic pride. A search on line for other city flags in Oregon surprised me by how many small communities have flags, not just the larger cities. People have different passions and interests in symbols for their schools, towns, cities, state etc. For instance I wonder how many citizens would know some of the more obscure state symbols for Oregon; for instance the State Shell (Oregon Triton), of course I looked it up. It was informative and there are many more State symbols that I was unaware of but they tell one a little something about our state. It’s not a bad thing to think about and appreciate where we live and what makes our community special. Betcha that the folks who were involved in the designing will remember and will benefit from the experience. Likely some of us elders will as well..
For what Joe? We are deep in the comments here. I, for one, need some explanation for such blanket statement. Hopefully no hassle Hasso. I wonder what it would have looked like if Ms. (fill in the blank) 3rd grade class thought of the idea first?